Jockey wheel bearings wear out, especially on mtbs, and the shifting becomes sloppy. Kcnc have used a full stainless bearing to give greater longevity over standard sealed bearings. Revitalise your rear derailleur and return to crisp shifting with these ultra-trick alloy wheels. KCNC 11T Jockey Wheels - Stainless Steel Bearing I put my review,which should be on these ones into the ceramic bearing ones by mistake! D`OH!! They`ve gone up abit since we got ours. 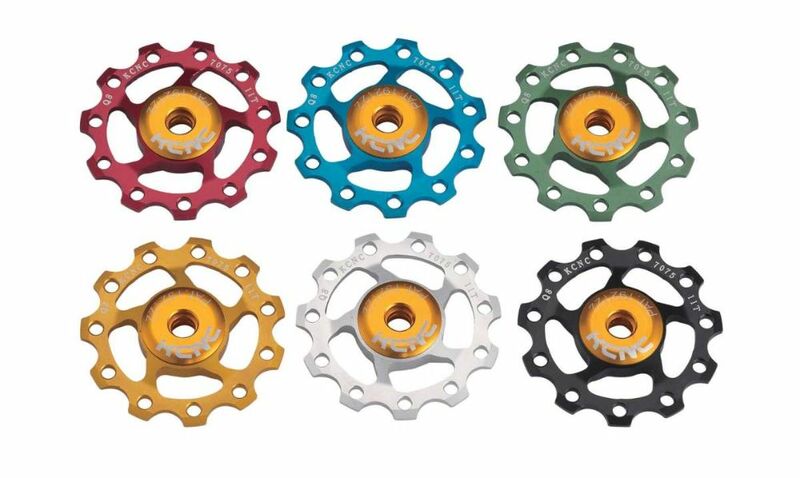 KCNC 11T Jockey Wheels - Stainless Steel Bearing I use these on my XC bike and DH bike. They out perform the standard X0 jockey wheels and they last much longer... oh, and they look the nuts !